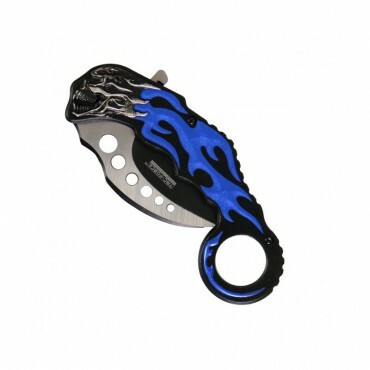 This blue flaming skull knife has a 3.5" blade.Get yours today!.. "Leather Master Deer Hunter Knife"Deer Hunter style hunting knife has a 4.5" fixed blade.Comes with heavy duty sheath.Get yours today!.. The Skull & Bones Knife features a 4" stainless steel blade and clip with five skull and crossbones decorating the handle.This knife makes a great gift for any biker.Get yours today!.. The Stiletto Type Knife features a4" stainless steel blade with beautiful wooden handle.This biker essential makes a great gift for any rider.Get yours today!..